Amongst the many advantages of online fundraising is the ability to see results quickly. In order to take advantage of this knowledge and analysis, it’s important to first establish your baseline numbers and understand how they compare to national averages, and why they may be similar or different. 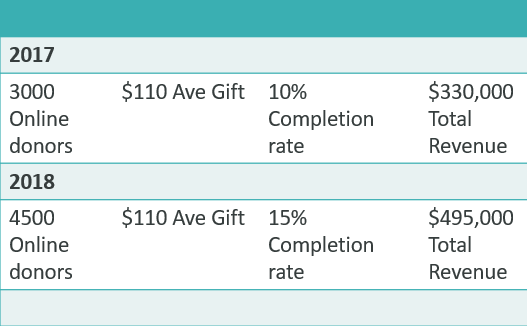 Making small improvements in donation page completion rate can make an enormous difference over time. Even if your station can commit to tracking just two of these numbers at first, you will begin to know what changes have helped your completion and which ones have hurt, as well as knowing if you are within the national average or have some more building to do. Additionally, having solid numbers that can show the potential increase in revenue can help you make sound choices about where to invest time and station resources in web development.